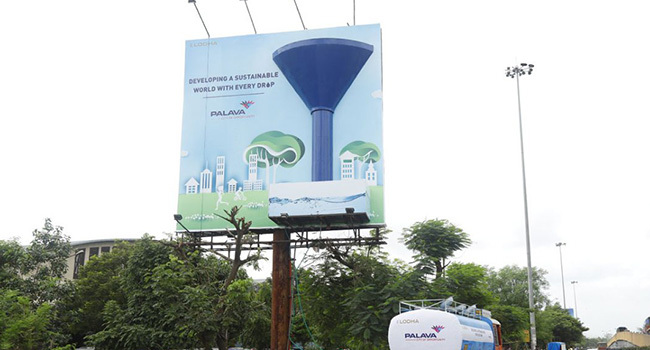 Extending Lodha Group’s commitment towards ‘Building a Better Life’, the Palava team installed an innovative hoarding featuring a funnel tank with a capacity of 3,000 litres, to propagate the idea of rainwater harvesting that can help combat the grave water shortage issues of Mumbai city. Set up outside Ghansoli Railway Station, the hoarding collected and filtered over 9,000 litres of water in a month, which supported the nearby shops and people passing by the same route. Wherein the rest of the water was transported to water shortage hit areas of Navi Mumbai like the slums of Nerul Darave, where the Palava team ended up supporting more than 50-60 families who used the water mainly for washing and cleaning purposes. The focus of this initiative was to deploy a sustainable solution and portray the power of a simple idea that can aid thousands in need. Surviving on water tanks while every year gallon of rain water gets wasted in this monsoon disposed city, this effort helped the slum dwellers survive longer on their corporation water supply.